Hotel Acadia is a charming hotel set in a peaceful and green setting 5 minutes from the center of Cannes. It boasts an outdoor swimming pool. Hotel Acadia features rooms with a simple and pretty decoration. After an afternoon spent on the beach, enjoy the cool evening air on the grounds. Hotel Acadia has a great location in a loop of the river, close to the golf course of Cannes-Mandelieu. The beach is 5 minutes away. On an island in a bend of the Siagne river, half a mile from the sea, the Resort Les Rives De Cannes Mandelieu spreads out on a 12 acre estate. Its South of France-style architecture (tile roofs, colorful shutters, arcades, etc.) blends in harmoniously with the natural setting. The resort is made up of 10 one or two-story buildings and includes many sports and recreational facilities. Enjoy full independence in a modern studio or apartment with a kitchenette. Half a mile from small shops and 2 miles from grocery stores, the resort is particularly appropriate for families. Mandelieu is a seaside resort with the largest marina in the Alpes Maritimes region and was awarded the "Water sports label" for its wide variety of water sports and activities. Located in the heart of a pleasant private estate in a major golf destination, the residence offers air-conditioned apartments and a beach volleyball court. The shops, the beach and Cannes Mandelieu's golf club are within a short distance. A wide choice of water sports and recreational activities can be enjoyed all year round. Le Rivage features spacious residences with terraces overlooking grounds with an outdoor swimming pool. It is in Mandelieu, just half a mile from the beaches of the French Riviera. The air-conditioned apartments and studios at the Rivage are all soundproof and each has private gardens or a terrace. All apartments have a flat-screen TV with satellite channels and a kitchenette that comes equipped with a dishwasher, microwave and refrigerator. The hotel provides a rental service for both cars and bicycles. The Rivage provides easy access to several tourist attractions such as the Cannes-Mandelieu Golf Club or the Space Centre. It is 5 miles from central Cannes and the famous Croisette. Pullman Cannes-Mandelieu is a luxury hotel with views of the Cannes Bay and Lerins Island. It features direct and free access to the sandy beach, outdoor swimming pool with furnished terrace, 2 tennis courts, a fitness center and a casino. Each air-conditioned and soundproof room and suite has a private terrace with either views of the golf course or the sea. They are also equipped with free Wi-Fi and a flat-screen TV with satellite channels. Activities in the nearby area include hiking, biking and water sports, with water equipment available for rent at the Pullman Cannes. Chateau de la Napoule is just under half a mile from the Pullman. Central Cannes is only 3 miles away and Cannes - Mandelieu Airport is one mile away. Situated just a few minutes from the beaches and from the wonderful marina of La Napoule, 5 minutes from Cannes, Les Bruyères offers well-equipped accommodations and quality services. Guests at Les Bruyères have access to the gorgeous outdoor swimming pool and pretty grounds. Les Bruyères is within close proximity of a shopping center, the San Peyre Forest and a public tennis court. Free private parking is provided at Les Bruyères, making it easy to explore the Côte d'Azur by car. This modern hotel with a restaurant and bar opened in 2007. It offers comfortable rooms in the center of Mandelieu, only 5 minutes from the beach and 10 minutes from central Cannes. Rooms at the Ibis Cannes Mandelieu are air conditioned and feature a work desk and a flat-screen TV. Breakfast is served starting at 4 a.m. to 12 p.m. and hot snacks are available 24-hours a day. In the fun hotel restaurant you can pick the ingredients for your own pasta creation. The friendly and attentive staff at the Ibis Cannes offer a range of services and will be happy to help you organize your stay in the Côte d'Azur 24-hours a day. Mandelieu’s numerous tourist attractions, including the impressive Château de la Napoule, can be easily reached from the hotel. The famous Palais des Festivals at Cannes is only a 10 minute drive away. Located in Mandelieu, the Hôtel de la Corniche D'or is just 110 yards from Mandelieu La Napoule Train Station. It offers Provençal-style rooms with a private balcony or terrace. The Corniche D'or is a 5 minute walk from the beach and each room has free Wi-Fi access and a private bathroom. Some rooms are also equipped with satellite TV. Guests can enjoy regional and traditional cuisine at the Corniche’s restaurant. There is also a terrace and a library with free newspapers. The Corniche D'or is a 10 minute drive along the French Riviera coastline to the Cannes-Mandelieu Airport. Local recreational activities include water sports and hiking trips. Mercure Cannes Mandelieu is located just 10 minutes by car from the Palais des Festivals and La Croisette. It offers a peaceful setting with swimming pool, solarium and terrace. The hotel offers a free shuttle to the Palais des Festivals during special events. Mercure Cannes Mandelieu is just 330 yards from fine sandy beaches. It features spacious and elegant rooms, a restaurant, a bar and 10 meeting rooms that can accommodate up to 150 people. Enjoy refreshments in the cozy bar from 11 a.m. to 12 a.m., and indulge in an array of traditional dishes in the lovely restaurant, L'Equinoxe. Located at the foot of the Tanneron Mountains, less than half a mile from the center of Mandelieu-la-Napoule and overlooking the bay of Cannes, this residence offers comfortable apartments with a private balcony. The apartments at Les Terrasses De Cannes Mandelieu are equipped with a kitchenette including an oven or microwave and private bathrooms. Guests at Les Terrasses benefit from access to an outdoor swimming pool and free private parking. The residence is the ideal base for exploring the Côte d’Azur, with magnificent towns such as Cannes, Saint Raphaël, and Saint Tropez all nearby. Please note that reservations can only be made from Saturday to Saturday. Résidence Carré Marine is located in Mandelieu-La Napoule and offers views of Cannes Marina. It offers 2 and 3-bedroom apartments with air conditioning and free Wi-Fi. All of the apartments have a kitchen area with fridge, dishwasher, tea and coffee making facilities. They also have a furnished terrace with access to the private grounds. Guests can enjoy the swimming pool, which is situated on the grounds. Résidence Carré Marine also provides fresh towels and linens upon arrival. A final cleaning service and a secure private parking lot are also available for an additional fee. On 17 acres of grounds, with a private lake and just over half a mile from Mandelieu Beach, is the MMV Resort&Spa. It showcases an outdoor swimming pool and a spa with a hot tub and hammam. A private balcony and an LCD TV with a DVD player are featured in all the suites at MMV Resort&Spa Cannes Mandelieu. Each has a sitting area and is in Provencal-style buildings around the water. Daily housekeeping and cleaning products are provided. French cuisine is served by the lake and a grill-style restaurant is by the swimming pool. Guests can also enjoy Mediterranean-inspired food from the Riviera take-out or a cocktail in the bar. On-site facilities include a sauna in the spa center and a kids’ club. Central Cannes is a 10-minute drive away and private parking is also available on site. Set near Cannes and facing the famous golf course of Cannes-Mandelieu, the Hostellerie du Golf hotel is in a green area. Its 55 guest rooms including 16 suites are all air-conditioned and equipped with satellite TV, minibar and safety deposit. Wi-Fi internet access is also available for an extra fee. Relax and fully unwind by the charming outdoor swimming pool. The Hostellerie also has a tennis court, a yard and a terrace. The perfect location of the hotel allows you to discover the beach set only 550 yards away, as well as the nearby golf course and casino. 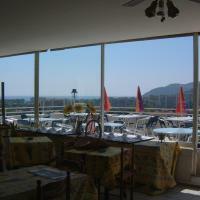 This hotel is on the Bay of Cannes, overlooking the Port of Napoule and the Lérins Islands. The rooms have views of the Mediterranean Sea or the Cannes Mandelieu golf course. The rooms at the Ermitage Du Riou are equipped with satellite TV and free Wi-Fi internet access. The Ermitage’s restaurant, The Riou, serves traditional French food. Meals can be enjoyed on the porch overlooking the river, on the terrace with sea views, or in the dining room. The hotel is in close proximity to the Mimosa Forest and the red rocks of l'Esterel. Free private parking is available on site. Located across from the Chateau de la Napoule, this hotel is 165 ft from the beach. It features a restaurant with a shaded terrace overlooking the castle and offers free Wi-Fi. Guests can enjoy refined French cuisine at the Restaurant L’O and enjoy an evening drink in the bar. Guests are also free to use the restaurant kitchen to prepare their own meals. The rooms at the Hotel Restaurant L’O are all air conditioned and feature flat-screen TVs with cable channels. Some also have views of the castle. Situated on the Mediterranean coast, L’O hotel is just a 10-minute drive from the center of Cannes and a 20-minute drive from Antibes. Set in a large park, just 2.5 km from Mandelieu beach, this residence offers fully equipped studios with furnished terrace and 3 outdoor swimming pools. All of the studios at Les 3 Rivières are accessible by lift. They feature a TV and bed linen and towels are available on request. Self-catering facilities are also provided including hotplates, a microwave and coffee facilities. Meals can be enjoyed in the dining area or on the terrace. Guests are invited to relax by the pools from May to September, and discover the city centre, just 300 metres from Lagrange Classic Les 3 Rivières. The residence is 4 km from Cannes Train Station and 37 km from Nice Côte d’Azur Airport. Private parking is possible on site at an additional charge. Villa Parisianna sits just 150 metres from the beach in Mandelieu-La Napoule, just 10 km from Cannes. Its lovely outdoor terrace is furnished with tables and chairs and filled with plants and flowers. A continental breakfast is available every morning. It is served in the dining room, on the outdoor terrace or in the comfort of your guest room. Flat-screen TV features in all of the en suite rooms at the Villa. Most rooms feature a view of the garden and some rooms have a balcony or terrace. Free public parking is available at a nearby location to the Villa Parisianna. Close to the Cote d’Azur, the Villa is just 40 km from Nice. Located just 800 metres from Mediterranean beaches, Motel Cap Sol has an outdoor swimming pool surrounded by sun loungers. The property consists of 2 separate buildings just a 5-minute walk from each other and offers air-conditioned rooms and self-catering accommodations with a balcony and garden views. A flat-screen TV with satellite channels, a fridge and a kettle are provided in each soundproofed room. All accommodations have a private bathroom with bath or shower. Guests also have access to a guest laundry. A continental breakfast is available every morning. Restaurants and bakeries can be found within 500 metres of the motel. Free private parking is provided on site. Mandelieu-la-Napoule Golf Club is 1 km from Motel Cap Sol. Cannes is 8 km away. Set across the street from the beach in Mandelieu-la-Napoule, this hotel offers free Wi-Fi access. Guests are invited to take in the views of the Mediterranean on the restaurant’s garden terrace. Flat-screen TVs feature in all of the air-conditioned guest rooms. Some of the rooms include private balconies with views of the sea, and all rooms have en suite bathrooms. Traditional French cuisine prepared with local products is proposed in Hotel La Calanque’s restaurant. Breakfast is served every morning, and the hotel has an on-site bar. The Château de La Napoule with its famous garden is situated opposite the hotel and the Napoule Train Station is just 200 metres away. Cannes is reached by car in 11 minutes. This apartment is 3.4 km from the centre of Mandelieu-la-Napoule and a 5-minute walk from the beach. It offers free Wi-Fi access, self-catering accommodation and an outdoor swimming pool. A terrace is also available. Located on the first floor of a residence, Appartement La Nautique offers a balcony with sea views, 2 flat-screen TVs and a private bathroom with a shower. Guests can prepare their own meals in the kitchen, which is equipped with a microwave, a refrigerator and a toaster. The property also includes a washing machine. 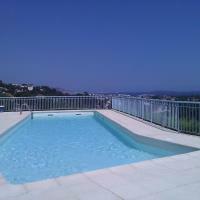 Appartement La Nautique is 1.6 km from Cannes Mandelieu Golf Course and 700 metres from Château de la Napoule. Free private parking is available on site. Hostellerie Blanche Neige, located 3 km from the beach, overlooks the sea and provides a seasonal swimming pool in its garden. 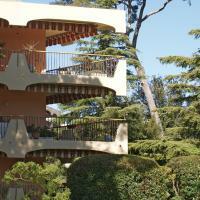 Guests are invited to the sun terrace or to the large dining room. The rooms have a flat-screen TV, a private bathroom and a view of the sea or the garden. Free Wi-Fi access is provided. A continental breakfast is available and can be served on the terrace or brought to your room. You can also request a traditional lunch or dinner. Table tennis and billiards are provided. Mandelieu Golf Club is located 2.7 km away. The city centre is 700 metres from the hotel. 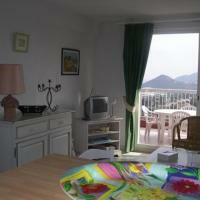 It is 4 km from Mandelieu Train Station and 10 km from Cannes. Villa Les Roches is 18th-century colonial house located in Madelieu-la-Napoule, on the French Riviera and 10 km from Cannes city centre. It features a garden and a terrace with views of the sea. Guests have access to the ground-floor apartment of the owner’s villa. There are 3 en suite bedrooms, a fully equipped kitchen and a living room with a sofa bed and a TV. Access to the A8 motorway is a 5-minute drive from Villa Les Roches and a 25-minute drive from nice Côte d’Azur Airport. Free private parking is provided at the villa. This apartment residence is set by the Siagne River in Mandelieu-la-Napoule and offers an outdoor pool and a terrace, just 1.4 km from the beach. 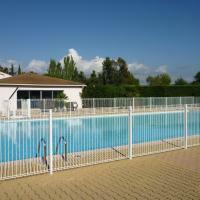 It is a 15-minute drive from central Cannes and proposes modern self-catering studios. A flat-screen TV and wired internet access are provided in each studio at Appart’City Cannes-Mandelieu. They also have a work desk, a wardrobe and a telephone. A buffet breakfast is served in the breakfast area every morning. All apartments feature a kitchenette equipped with a dishwasher and a microwave and meals can be enjoyed in the dining area. Cannes-La Bocca Train Station is 5.3 km from the property and Cannes-Mandelieu Airport is a 10-minute drive away. The residence is a 25-minute drive from the centre of Antibes. Located just 700 metres from Robinson Beach in Mandelieu, Les Jardins Du Golf offers a swimming pool and a tennis and pétanque court. Cannes Mandelieu Golf is just 300 metres away. The apartment features a veranda with a river view, a flat-screen TV, DVD player, seating area, ironing facilities and a private bathroom. The kitchen is equipped with an oven, dishwasher and microwave. Grocery shops and restaurants are ideally located within 150 metres of the property and from Port de Cannes, 7 km away, guests can visit the Iles de Lérins by boat. Free private parking is possible on site. Nice single-family house. 200 m from the centre of La Napoule, on top of a hill, 300 m from the sea. Private: grounds 1'200 m2 (fenced), lawn and flowers, swimming pool (5 x 10 m, depth 50 - 200 cm, 01.05.-01.10.). Shop 300 m, restaurant 200 m, sandy beach 300 m.
Mandelieu: Residence "Les Grands Coteaux", 4 storeys. In the district of Riviera Golf, 4 km from the sea, 4 km from the beach. For shared use: swimming pool (15.05.-15.09.). Shop 3 km, shopping centre 3 km, restaurant 2 km. Golf course (18 hole) 100 m.
Villa Lou Jas Mandelieu is located 2 km to the center of Mandelieu. It has a fully equipped kitchen, living and dining area, bathrooms and four bedrooms. It has three floors. You can enjoy the terrace and the garden with garden furniture and barbecue, as well as the swimming pool. There is internet connection (DSL/LAN) in the house. The Villa is 5 km from the sea and the beach. There is a supermarket at a distance of 3 km and a restaurant and other shops at a distance of 2 km. Apartment Collines Bellevue is a part of the complex Colline de Bellevues and it is located 2 km to the center of Mandelieu, on top of a hill. It has a fully equipped kitchen, living and dining area, bathroom and two bedrooms. You can enjoy the terrace with terrace furniture, as well as the swimming pool which is shared with other guests. The Villa is 4 km from the sea an the beach. There are shops and a restaurant at a distance of 1.5 km, supermarket at 3 km and golf course at 4 km. 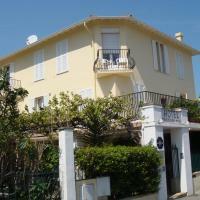 Hostellerie de Minelle is located in Mandelieu, just 9 km from central Cannes and 2 km from the beach. The hotel offers a terrace, a garden and free Wi-Fi internet access. The guest rooms are simply decorated and include a TV. Some rooms are air-conditioned and have a private bathroom and a balcony with a view of the garden. A continental breakfast can be enjoyed on the terrace on sunny mornings. The on-site restaurant serves traditional French dishes. Free private parking is available on site and the Palais des Festivals in Cannes is just 14 km away. The property is a 30-minute drive from Nice and a 25-minute drive from Fréjus and Saint-Raphaël. Villa Prince de Galles offers self-catering accommodation Located 800 metres from the town centre of Mandelieu, a 15-minute drive from Cannes. It is set in a private residence with an outdoor swimming pool and free private parking on site. The villa has a spacious, private, furnished terrace with views of the sea and the hills in the distance. The living room has a lounge area with a TV and a dining table. The open-plan kitchen is fully equipped. There are 3 bedrooms, each with a balcony, and 3 bathrooms. You will find a choice of shops and restaurants in the town centre, and the beaches are 4 km from the villa. Both Riviera Golf de Barbossi and Old Course Cannes Mandelieu golf courses are within a 10-minute drive. Located in Mandelieu-La-Napoule, 800 metres from the sea, this property features an outdoor swimming pool, pétanque facilities and children’s playground. Cannes is a 15-minute drive away. Each self-catering studio/apartment at Les Rives de Cannes Mandelieu includes a fully equipped kitchenette, a private terrace and a seating area with an LCD TV. A bar and a restaurant are at your disposal on site. With free private parking on site, Les Rives de Cannes Mandelieu is a 25-minute drive from Antibes and 30 km from Nice Airport. 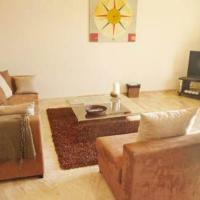 This 1 room apartment is located in Mandelieu and is 29 m2 in size. It has 1 bedroom and is suitable for 4 people. This apartment is a part of "MMV Resort" and is located on the 2nd floor. The apartment has a living room with a double sofa bed and an open kitchen with a small stove and microwave. There is a sleeping alcove with a double bed and the apartment features a small furnished terrace. The resort features large park with grass and flowers, a shared outdoor swimming pool, tennis, table tennis and a children's play ground. You may also make use of the sauna, steam room and whirlpool. The resort is located 2km from the city center and 1km from the Sea. In the complex you may find grocers and restaurants.